I have found, in my years of practicing correctional medicine, that few practitioners who come to corrections are comfortable with insulin dosing. In my experience, this is especially true for physician assistants and nurse practitioners, but many physicians have problems, too. Insulin dosing can be complicated and tricky at times, but for most patients, 10 simple rules will get you to where you need to be. There are two types of insulin used for two very different purposes when treating type 1 diabetics. The first is basal insulin, which is used to replace the insulin that the normal pancreas releases constantly—whether we eat or not. Long-acting insulin is used to provide coverage for the basal metabolic needs of type 1 diabetics. Examples are insulin glargine (Lantus) and insulin detemir (Levemir). The most commonly used long-acting insulin is Lantus, so I am going to use that name in this article. (I have no financial ties to the maker of Lantus—I use that name because it is the name most commonly used by patients). The second type of insulin that type 1 diabetics need is short-acting insulin, which is given to cover the carbohydrates in the food they eat. Short-acting insulins are given just before a meal or snack and, ideally, the dose should vary depending on how many carbohydrates are in the food. Examples of short acting insulins are insulin regular, insulin aspart (Novolog) and insulin lispro (Humalog). Again, I will use the term Humalog in this article because it is the term most often used by patients themselves. And again, I have no ties to the maker of Humalog. Finally, I must point out that there are other insulin dosing systems besides the Lantus-Humalog system I am presenting here. For example, many patients now use insulin pumps, and some still use the older NPH-Humulin system. We are going to apply our rules to two imaginary patients. “Jeffrey” has been newly diagnosed as being a type 1 diabetic. “Ernest” has been taking insulin since he was a child. Both have come to our jail and need insulin orders written. By going through the rules of insulin, we can quickly and easily calculate appropriate insulin orders for these two patients. The basic unit of insulin dosing is the total daily dose, abbreviated TDD. If you count up every unit of insulin that a patient takes in one day, that is that patient’s TDD. Example: Yesterday, Ernest took 33 units of Lantus insulin and 57 units of Humalog. His TDD was 90. The TDD for most patients should be approximately 0.5-1.0 unit per kilogram of weight. Ernest weighs 100 kg. Multiply this by 0.5 to1.0 units and you get a range of 50 units to 100 units of insulin a day. Ernest’s TDD is 90, which is about right, though at the high end of the range. Jeffrey is a newly diagnosed type 1 diabetic. What should his beginning insulin dosage be? Generally, you should begin dosing at the low end of the range and gradually move up. Jeffrey weighs 80 kg and we want to start at around 0.5 units per kilogram, which equals a TDD of 40 units per day. Approximately half of each patient’s TDD should be Lantus and half Humalog. We calculated Jeffrey’s initial TDD at 40 units, so half of this, 20 units, should be given as Lantus and the other 20 units will be given as Humalog. Lantus normally is dosed once a day. Notice that Ernest is taking too little Lantus. He is taking 33 units of Lantus per day, but since his TDD is 90, his dose should be around 45. That change should reduce his need for Humalog, which should fall to around another 45 units. Humalog covers what the patient eats. It should be split between the meals the patient eats during the day. If a patient eats six equal meals, the Humalog units should be split by six. However, since inmates generally eat only three meals a day (and assuming that the three meals contain approximately the same number of carbohydrate grams), the Humalog should be split into thirds. We have calculated that Ernest’s daily Humalog dose is 45 units. Divide that by 3 and Ernest should get approximately 15 units before each jail meal. We estimated Jeffrey’s initial daily Humalog dose to be 20 units. Let’s add one to that (these are estimates, after all, so let’s make things easy) to get 21 units. Divide that by three and Jeffrey will get 7 units before each meal. By the way, it is OK to unbalance the 50-50 ratio a little to make dosing work. When we do, the patient should usually take a little more Humalog. So, to summarize, the initial orders for Jeffrey will be Lantus 20 units daily and Humalog 7 units before each meal. The initial orders for Ernest will be Lantus 45 units daily and Humalog 15 units before each meal. We can use the TDD and the “Rule of 500” to calculate how many grams of carbohydrate each unit of Humalog will cover. 500 divided by the TDD equals the number of carbs covered by one unit of Humalog. Jeffrey has a TDD of 41. 500 divided by 41 equals about 12. Each unit of Humalog will cover approximately 12 grams of carbohydrates. For Ernest, 500 divided by 90 (his TDD) equals about 6. Each unit of Humalog will cover approximately 6 grams of carbs. This becomes important if, as sometimes is done, these patients are given a diabetic snack at bedtime. Snacks should be covered by Humalog! So if the diabetic snack is, say, a peanut butter sandwich containing 24 grams of carbohydrates, Jeffrey should get 2 units of Humalog to cover the snack and Ernest should get 4 units. Let’s say that we check Jeffrey’s blood sugar before lunch and discover that it is a whopping 500. Jeffrey is already getting 7 units of Humalog to cover his meal. How much extra should he get to bring his blood sugar down to normal? The “Rule of 1800” will solve this problem. Here, 1800 divided by the TDD tells you how far the patient’s blood sugar will drop with each unit of Humalog. In Jeffrey’s case, 1800 divided by 41 equals about 44. Since each unit of extra Humalog will be expected to drop his blood sugar by around 44, if we want to drop him from 500 to 100, we will need to give him an extra 9 units of Humalog along with his regular dose of 7 units. So we can give him 16 units of Humalog before lunch and expect his blood sugar to fall to around 100 after lunch. In Ernest’s case, 1800 divided by his TDD of 90 equals 20. So his blood sugar will only drop by around 20 points with each extra unit of Humalog he is given. To drop his blood sugar from 500 to 100, he will need 20 extra units of Humalog. Add these to the 15 units we are giving him to cover lunch, and the total is 35 units of Humalog. The rule of 1800 can be used to create a patient-specific sliding scale so that high blood sugar levels are addressed each time they arise. This rule tells us how fast to adjust a patient’s insulin dose. Let’s say Jeffrey’s blood sugars are consistently in the 300s. His insulin dosage needs to be increased. This rule says to increase the dosage by no more than 5% to 10% every two to three days until you reach your goal. You must remember to keep the (approximate) 50-50 balance between Lantus and Humalog. Since Jeffrey was taking a TDD of 41 units, 5% to 10% of that is 2 to 4 units. One way to add another 4 units to Jeffrey’s TDD would be to increase his Lantus dose to 21 units a day and increase his Humalog to 8 units each meal. If he is still running too high in 2 to 3 days, we can increase his Lantus by 3 units to bring him back to perfect 50-50 balance (24 units of Lantus, 24 units of Humalog divided between three meals). If you have been using a sliding scale, another way to make insulin dose adjustments is to add all of the sliding scale doses the patient has been given to the previous TDD and then recalculate the 50-50 Lantus-Humalog split based on the new TDD. For example, Ernest was taking a TDD of 90 units. However, he also received an average of 10 units of sliding scale insulin every day. His new TDD is 90 plus 10 for a total of 100 units. Divide this in half and his new Lantus order is 50 units and his new Humalog dose is 50 units divided between three meals. Notice that this is a much more aggressive increase of insulin dose. Be sure to consider the next rule, No. Eight, each and every time before you make a large insulin dose adjustment. If a patient’s blood sugar is running high, check his commissary purchases! Remember that blood sugar is dependent on two factors: what the patient eats and how much insulin he is taking. If you cannot bring blood sugar under control, often the reason is that the patient is eating extra “junk” that he purchased from the commissary. 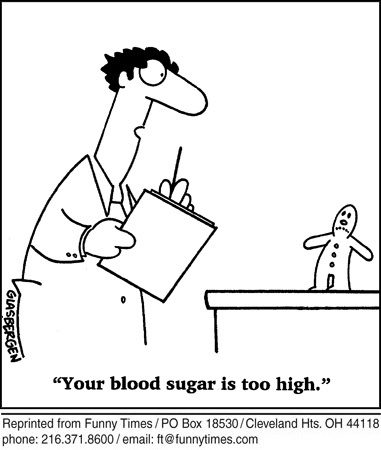 This is also often true of patients whose blood sugars jump around a lot—now way too high and now too low. Let’s say we notice that we have steadily increased Ernest’s TDD of insulin until he is taking more than 1.0 unit per kilogram. “That’s odd,” we think. So applying Rule No. 8, we check his commissary purchases and find that he is buying an average of 10 ramen noodles, 15 candy bars and 10 bags of chips each week. Ernest needs some serious diabetic nutrition counseling. If we don’t change his eating habits, we will never control his diabetes adequately. Approximately 20% of type 1 diabetics need to have their Lantus dose divided and given twice a day. The reason is that Lantus lasts for 20 to 24+ hours, depending on the patient. If Jeffrey is a rapid metabolizer of Lantus, he will “run out” of Lantus in less than 24 hours. We will know this because his blood sugars will be running high just before he takes his Lantus dose. The solution is to divide the dose and give it BID. If Jeffrey is taking 24 units of Lantus, we would divide this and give him 12 units BID. What about NPH? This intermediate-acting insulin is usually given twice a day. In type 1 diabetics, NPH is usually given along with regular insulin. Lots of patients who come into the jail are still taking NPH and Humulin insulin, often prepackaged as 70-30 insulin, which contains 70% NPH and 30% Humulin. So it is useful to know how to dose NPH insulin. NPH and Humulin are dosed using the “2/3, 1/3 Rule,” which states that the TDD is split as 2/3 NPH and 1/3 Humulin. Furthermore, 2/3 of the daily dose is given in the morning and 1/3 is given in the evening. So let’s say that John’s TDD of insulin is 90 units. Each day he will take 60 units of NPH and 30 units of Humulin. These will be split so that he takes 40 units of NPH plus 20 units of Humulin in the morning and 20 units of NPH plus 10 units of Humulin in the evening. Since NPH and Humulin usually are already conveniently packaged as 70-30 insulin, all we have to do is give 2/3 of the patient’s dose in the morning and 1/3 in the evening. This entry was posted in Diabetes, Drug Evaluations, Medical Practice and tagged correctional medicine, Diabetes mellitus, evidence based medicine, Humalog, Insulin, jail medicine, jails, Lantus, prisons on February 26, 2012 by Jeffrey Keller MD. Thanks Bruce. Unfortunately, there are no pre-2012 archives! I began the blog in January 2012. Just the information I was looking for. Concise, all in one place with easy to understand explanations. Thank You! Any experience to share regarding insulin usage for type 2 diabetes? 1. The only medication that has ever been shown to reduce overall rates of death, heart attacks and strokes in type 2 diabetics is metformin. Insulin has not been shown to improve these statistics. 2. Early on in the course of type 2 diabetics (meaning in the first 15-20 years), Type 2 diabetics have increased levels of their own insulin. They have plenty of insulin. Giving these patients insulin does not make a lot of sense to me. Instead the problem is that their pancreatic beta cells are being overwhelmed by the huge amounts of carbs flooding the system. The solution is not more insulin, but less carbs. They need to change their eating habits. And lose weight. 3. After 15-20 years of type 2 diabetes, beta cells burn out and endogenous insulin levels fall below normal levels. These patients are the so-called “Type 1 and 1/2” diabetics. They should all be treated with insulin. So, for those long time type 2 patients, they gradually become type1? And they should be treated as type 1? No, they don’t usually become Type ones. They are still Type 2s, but with an inadequate amount of insulin. Usually, if you are going to give these old Type 2s insulin, you only need to use long acting insulin, like Lantus. More on all of this at some future date! Confused by this “new” category of diabetes called Type 1 1/2? This category is not intended to explain the Type 1 who has insulin resistance due to obesity, or, the Type 2 who now must take exogenous insulin, but rather the Type 2 who now has the presence of anti-insulin antibodies. Many Type 1 patients will find benefit from adding metformin. Those with Type 2 may need insulin injections over time. Unfortunately type 2 diabetics who start supplementing their oral agents with insulin rarely are able to lose weight and stop insulin injections. Hope that clarifies. Thanks so much for the excellent article. Eager to learn more about type 2 insulin usage from you. This is a great reference, thank you. I am a nurse that will start work with a brittle diabetic 5 year old child in the school system next year. This helped give me an excellent background on how to approach this situation and work with her primary care provider. I am working in a Sub acute Medical Unit in Australia and adjusting insulin doses is a difficult task. Ur article is EXCELLENT- to the point and very practical. Keep up the good work- plz do write about DM2 management. Thanks for the kind comment, Sharif! I will write about Type 2 Diabetes soon. It is a much more complicated and controversial topic. Hi jefrry, This was always a haunting task for me whenever a diabetic comes to my clinic. I work in remote area where the acsess to a diabetelogist is a 1 hour journey. This tutorial was so good and the way you presented it was awsome. Simple and crisp. ! You and your blog is really helpfull to clinicians like me. And it deserves an appreciation. My honest response is that this system requires more factoring than your average LPN working in the correctional facility is capable of or willing to do. I’ve discovered nurses who falsify low reading just to avoid doing blood sugars or giving insulin! A much better system which has numerous benefits including inmate transfers, religious fasting, refusal to eat, etc. is to utilize the basal/bolus system. Give Lantus once or twice a day. (In this setting that provides early meals and little evening snacking, once a day Lantus is usually adequate. Rather than AC blood sugars + a guesstimate of carbs to be injested, replace with a 1 hour PC blood sugar readings and then cover with a sliding scale of short acting insulin. My husband, also a physician, and I find this system perfect for when we are attending social events, buffet restaurants, ? casseroles, chinese ,etc. We adopt an “eat what you want, cover what you eat” attitude. So many facilities, including hospitals, feel their staff isn’t capable of counting carbs, so the treat elevated blood sugars prior to the meal and give no coverage for the carbs about to be consumed. Or, as in the nursing home setting, there is no guarantee that the resident will eat. Changing to this system allows for transport without worry of hypoglycemia/missed meals. A1c’s are impressive. This is a win/win. Easy on staff, better for inmate. Oh, an aside, a carb is a carb and takes no more insulin for a Hershey bar that 2 slices of bread. Let them eat commissary, wait awhile, check and cover. After 47 yrs on insulin, i can work, travel abroad, eat what I want, and still love my kidney function! Very helpful! Love your blog!! Thanks a lot for your meaningful and very useful post regarding insulin dosing. Dear sir, would u please explain the insulin dosing methods for Type 2 diabetics who are using oral hypoglycemics and they need to be put on insulin along with hypoglycemics. Thank you!! How the dosing be done if NPH (isophane) alone is used? In my opinion, NPH should not be the only insulin used in Type 1 DM patients. Use 70/30, it is no more expensive, and dosed according to the article. If you are talking about a Type 2 DM patient, then it is appropriate to use just NPH for some of these patients, but I did nopt talk about that in this article. Maybe I’ll tackle that in a future article! Thank you dr.keller for the reply. But in my clinic, there use to be situtions when 30/70 is not available. The only supply wud be NPH (isophane). So it wud be great and helpfull if you could cover that topic in the coming days. I am a type 2 diabetic. I have been through the ringer with all of the different medications and because they make me so sick, my doctor started me on insulin. I have counted practically every carb and gram of sugar. No cokes, candy, or other junk. I am also a jailer. Inmates can’t get away with anything. I love your blog. My nurse asked me if diabetes ran in my family because I was so small. Everyone has diabetes in my family. This is a great article. I love your blog; please write more! I just started as a jail NP and I find your blogs so helpful. Just starting a job as a NP at a local Maxiumum security prison near my home. I have been a nurse 37 years with 17 of that as a NP. Insulin still confuses me! This article has helped take some of the fear away and I printed it so I can take it with me to refer to. I really enjoy your articles and read everyone of them eagerly. You can always brush up and learn no matter how long you have been in medicine. Thanks again.